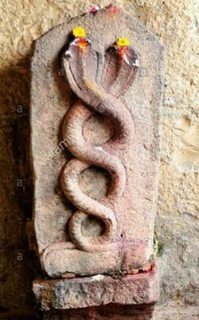 In many hindu Temples we can see Snake Idol which has Two Snakes in Binded form Like a DNA. What does the Two snakes in Binded Form Indicate and why do we worship it ? Browse other questions tagged mythology temple worship idols . Why are vahanas placed outside the main temple instead of near the deity? Why dandvat pranam has more importance? Who is the true Nagaraja, the King of Nagas? Is sarpa worship and Naga worship different? What are the fruits of Snake worship?